A supercell thunderstorm developed in northern Connecticut Saturday morning before moving into central Massachusetts. Images posted to Facebook show damage to buildings in downtown Webster. A woman sustained minor injuries in Webster after debris landed on her vehicle. Damage was also reported in Dudley and Woodstock. A severe thunderstorm that spawned a tornado has damaged buildings, injured a woman and knocked down trees in southeastern Massachusetts. 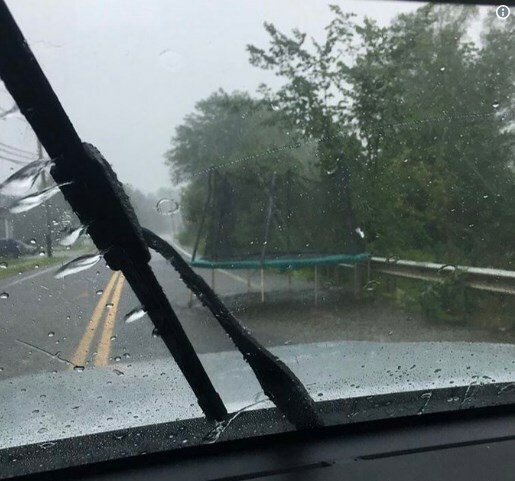 On Saturday morning, a supercell thunderstorm developed in northern Connecticut before moving into central Massachusetts, where it triggered a tornado warning in Worcester to Middlesex County, weather.com meteorologist Linda Lam said. A woman was injured in Webster when debris fell on her automobile. Local police said the woman was transported to an area hospital with minor injuries, the Associated Press reports. Images posted to social media show significant damage to buildings identified as the Clinton Savings Bank and Brothers Market on Main Street in Webster, which is located about 60 miles southwest of Boston. The National Weather Service rated the tornado an EF1 with winds over 100 mph, noting damage to homes, along with downed trees and power lines in the town that is home to about 16,700 people. One report noted that several granite slabs were lifted and thrown into the roadway. NWS crews are still determining the path and duration of the twister. Overnight, wet weather caused a Pan Am Railway freight train to derail near Wendell, Massachusetts. Six cars overturned, including four carrying hydrochloric acid. A hazmat team responded and confirmed that there were no leaks. No injuries were reported. A second short-lived tornado in Woodstock, Connecticut, was confirmed and rated EF0 Saturday afternoon. 0 Response to "EF1 Tornado Damages Dozens of Buildings, Injures 1 in Massachusetts"